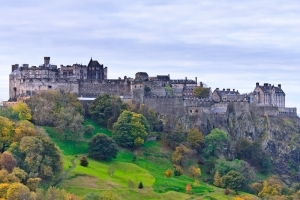 Edinburgh Castle, the main attraction of the capital of Scotland, stands at the top of a basalt rock, which was formed from the lava of an extinct volcano. 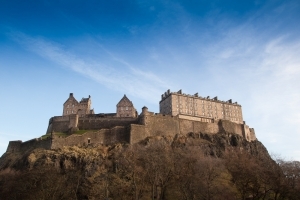 The beauty and monumentalism of this old castle attract to Edinburgh large crowds of tourist who want to see the seat of Scottish rulers – a symbol of resistance and revolts of an independent nation – with their own eyes. 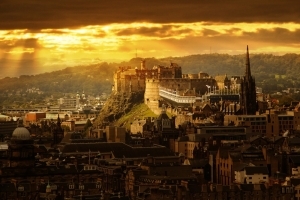 The crown, the sceptre and the sword are kept in Edinburgh Castle, these are the regalia of Scottish kings and the famous Stone of Destiny, Scotland's holy artefact. 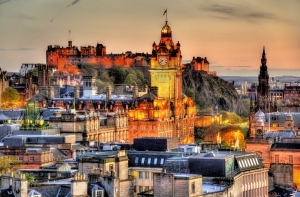 The land of Edinburgh Castle is a cluster of historic buildings and museums that will definitely be interesting for tourists: the Royal Palace, barracks and the arsenal, the Governors House, former prison vaults, the oldest building in Edinburgh – St. Margaret Chapel and many other interesting sites. The route to the former stronghold, like in the old days, runs along the east side of the castle hill. 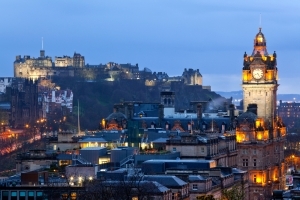 The winding route called "Royal Mile" is part of a popular tourist route connecting Edinburgh Castle with Holyrood Palace, which you can visit unless members of the Royal Family are there. In the Naval and Military Museum a rich collection of armament and other items related to the history of Scotland from the past several centuries are kept. Many artillery pieces were placed on the massive walls of the stronghold, among them is the One O'Clock Gun which is fired every day, except for Sundays, Good Friday and Christmas; precisely at one o'clock a single salvo is fired. A military orchestra festival, which takes place on an esplanade in front of the castle in August, enjoys a great popularity among tourists all over the world. It began with a military parade but over some decades the event was increasingly gaining unusual popularity as a really magical show and it is broadcast in 30 countries, gathering in front of the TV around 100 million viewers. 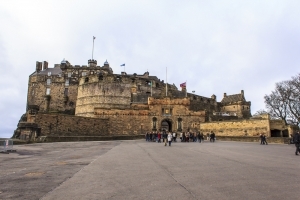 The crowning of the festival is a performance by a sole piper on the serrated castle walls who plays a tune in honour of Scottish soldiers killed in different periods of time. April - September - from 09:30 a.m. to 6:00 p.m.
October - March - from 09:30 a.m. to 5:00 p.m.
Closed on 25 and 26 December.